A refreshing blend of pineapple, banana and other tropical flavors. The rich, smooth tastes of two caffeine–free African herbs — honeybush and Rooibos — are perfectly complemented by the summertime style of pineapples, bananas, and other refreshing tropical tastes. Take the bite out of the dog days of summer with this refreshing, caffeine–free blend. Use 1 or 2 tea bags for each 8 ounces of water. Pour cool water over tea bags. Brew for 5 to 10 minutes. For a stronger brew, use more tea bags and brew for 10 minutes. Best if used within 72 hours. Hibiscus, honeybush, rooibos, rosehips, orange peel, natural flavors (contains soy lecithin), roasted chicory, citric acid and lemon peel. 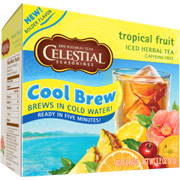 Vanessa "This is the best iced tea"
Cool Brew Tea Tropical Fruit - 40 bags is shipped in a discrete, unmarked package. Orders are processed immediately and usually takes about 3 to 5 working days to be received. We do ask that you try it for 2 to 3 weeks to feel the full effects. Any information received is used only for order processing and shipping purposes. Your information, such as e-mail address, will never be disclosed to a third party.